This workers’ paper circulates between 2-3 lakh workers every month. Everybody has her or his own specific relationship with it. The paper is read, remembered, read to others, critiqued, kept with care, photocopied and redistributed, compared with other sources of information, evaluated, weighed, tested, questioned, argued with, used, torn, thrown away, given importance to, respected. Liveliness surrounds it. This is the daily life of this paper. The lives of each one of us is made up of similar diversities and differences, likings and disinterests, respect, curiosity and fullness. Some people are envious of this expanse. One such person said to us, “Where does the money for such expansiveness come from?” We thought we must consider this with some amount of seriousness. Continuing in this vein, we could say that printing 12,000 copies of this paper costs the same as the monthly minimum wage of a skilled worker, as under Delhi government rates. A friend disagreed and said, “No, even lesser!” The voluntary support and contributions of a handful of people makes printing 10-20,000 copies of this paper a very simple thing. Friends, printing this paper poses no difficulty. Given the excitement, enthusiasm and support around this paper, printing even one hundred thousand copies would be ordinary. Recently, a few students and young teachers requested us for 1000 copies of the paper so that they could take them to a new industrial area and test their thinking in a larger landscape. That’s why this month we’ve printed 13,000 copies. Like we’ve described in some of our previous issues, the industrial areas surrounding Delhi are among the most buoyant and volatile in the world. Critical and urgent questions about thought and action are being posed here. We can say with utmost confidence that it is from within these spaces that the sharpest and most edgy possibilities are emergent, confronting the contradictions and conundrums of the present. Very soon, a form of living that is in praise of the potential of the seven billion inhabitants of this planet will find its expression. Wait – Do you think we’re getting carried away? Every month, 20-25 people distribute this paper in 15 places in Okhla Industrial Area, Udyog Vihar (Gurgaon), IMT Manesar and Faridabad. Every month, during distribution, different kinds of conversations are struck up with thousands of people. You could say that each person who distributes the paper threads some form of conversation with perhaps 10,000 people in a year. A current of joyfulness rises from this conversational space. It stays in collision with the language of complaints, oppression and pain. It is generative. It pushes aside exhaustion, pessimism, anger and helplessness, and makes something else emerge in their stead. For the last year now, in different issues of the paper, we have been talking about a new category of “political prisoners” that has arisen here in the last few years. We’ve posed this argument, and it has traveled between a few lakh people. No one has thought it wrong, or dismissed it as an overstatement. Rather, it has been taken forward and has entered other platforms and public forums. 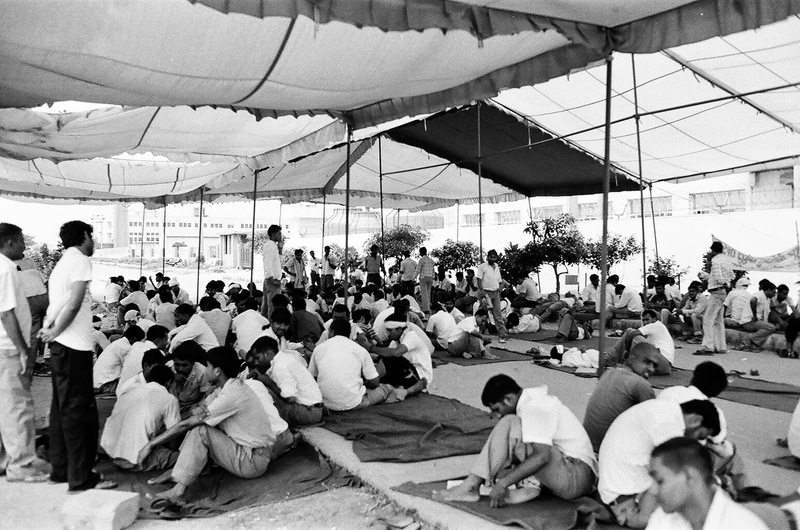 500 to 600 workers from factories just from around Delhi are political prisoners of today. They are being kept in jail without bail for years. There’s a general consensus that these are political prisoners. However, what we would like to underline here is a desire that has surfaced in many a conversation, but hasn’t yet gathered the force of general actions. This desire is about how – as individuals, and as collectives – we can all, together, author a tense weave that compels the release of these political prisoners. Here are suggestions that have come our way: During tea breaks, at lunch hour, while in the bus, when the shift ends, when the shift begins, in the neighborhood, at the teashop, at the paan kiosk, at the dhaaba, in the park, at a feast, in the village, via SMS, through handwritten pamphlets, with posters, in letters, on placards, by printing on t-shirts, at the barber’s, in the college canteen, in classrooms, in discussion groups and meetings, in essays, through stories, in poems, on blogs, on Facebook and on Twitter, in offices, while travelling, when on a pilgrimage, between friends, via letters to editors, through translating – everywhere, with everyone, whenever time permits – amplify, accelerate the ongoing disquiet of murmurs about these political prisoners. This in itself will dishevel power’s fragile but arrogant attire. Visit these political prisoners. These conversations, you’d agree, must happen with them as well.